Personal connections between people have always been a major factor for success in business, and networking nowadays has become a major trend in all kind of industries. 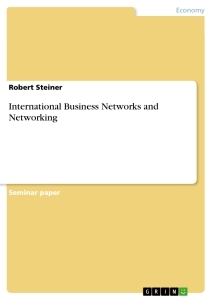 With the increasing availability of internet connections (comScore Networks 2006) and use of social networking platforms (Trend IQ 2004: 15), networking and internetworking has become an important activity for most employed and self-employed people – these days networking is easier, more effective and efficient than it has ever been before. This paper has a dual objective. On the one hand, it seeks to explore four of the most interesting and important social networks for people in Europe to extend their own networks and thus to increase their success in business (Open Business Club GmbH 2006: 1-2). On the other hand, it aims to highlight the "do's and dont's" of networking that should allow the reader to avoid the most common pitfalls in networking as well as to increase his own networking efficiency and effectiveness. According to a recent press release, the Open Business Club has more than one million registered users and 150 million page impressions per month, therefore representing the most active and largest business networking platform in Europe with more than 15 different interface languages available. Due to this position in the networking industry the author will use the Open Business Club for most comparisons in the remainder of this paper. - The non-premium membership is for free and allows users to be found and contacted via the networking platform by other members. Moreover, non-premium members can also search for other members as well as reading and contributing to all kind of message boards. - The premium membership costs EUR 5.95 per month. In addition to the features mentioned above, the premium membership offers advanced search functions, the possibility to contact other members of the Open Business Club via a direct messaging system on the platform as well as some other minor advantages. One of the Open Business Club's main strengths is its popularity in Europe, deriving from an excellent usability of the platform and a steadily growing membership base that in turn makes the network even more attractive to non-members. However, as there are no membership criteria and as everyone can become a member, it is becoming increasingly difficult to find those people you are looking for among more than one million members. This also means that the focus of the Open Business Club lies more on quantity rather than on quality of its members. From a technical point of view, successBC offers in general a similar platform with similar features like the Open Business Club. Contrary to the Open Business Club, however, successBC focuses much more on quality rather than on quantity, and as one of the first online networking platforms successBC has also recognized that networking itself should not be viewed as a goal, but much more as a means of "Creating real value through networking" for one's business. Accordingly, successBC has just a friction of the Open Business Club's members, but every single person registered with successBC is an authentic networker really striving to create value. successBC's focus on quality is also reflected in the membership fee that is significantly higher than at Open Business Club, EUR 14.95 compared to EUR 5.95 per month. Compared to all other major business networks, successBC has its strength in offering real quality and value for one's money. Although the monthly membership fee is well above the average, one should see the membership fee rather as an investment than cost as an active networker's return on this investment is expected to be a multiple of EUR 14.95. On the other hand, however, successBC is still in a very early stage of its development and it is managed by a single person. This is to say that the network is still relatively small and the activity level on the platform is relatively low. Additionally, compared to the platform of the Open Business Club, successBC's platform still needs a lot of improvements to offer an acceptable usability. In sharp contrast to both networks mentioned above – Open Business Club and successBC – The Evolutiner Club is a charitable organization, has strict membership criteria and does not provide an online networking platform. However, it offers its members a small network of trusted contacts all over the world and it organizes an annual charity gala diner with a famous keynote speaker like Mikchail Gorbachev in 2006. As The Evolutiner Club is a closed network of selected members, a rigorous membership application process is in place. To become a member, you have to be among the target groups of members of executive committees, managing directors, wealthy private people or representatives of governments. The next step in the application process requires applicants to send their application documents to The Evolutiner Club's board of directors that meets once a month in order to accept or decline membership approvals and to hold telephone interviews with the applicants if necessary. If one finally manages to become a member, there is a one-time admission fee of EUR 2,500 and a yearly membership fee of EUR 500 in the years after. Such advanced search functions include searching for members who have recently visited one's profile, members who already know several contacts of one's own, members who have recently visited my website etc.